D.C. Mayor Muriel Bowser said a preliminary report on the District's response to the recent deadly smoke incident on Metro will be released within the next 48 hours, she announced Thursday. The report will come from D.C. Fire & Emergency Medical Services, which will review recorded radio traffic and personnel interviews, reported NBC4's Kristin Wright. Questions have arisen over the timing of the city's emergency response. Passengers on a smoke-filled Metro train were still asking when help would arrive 23 minutes after the smoke was first reported at the L'Enfant Plaza Metro station, D.C. officials said Thursday. City Administrator Rashad Young released a preliminary timeline on Monday's fatal smoke incident, which killed one woman and sent nearly 70 other people to the hospital. The Office of the Chief Medical Examiner ruled 61-year-old Carol Glover's death accidental by acute respiratory failure from smoke exposure. Thirteen emergency calls were initially placed either to 911 or to the Office of Unified Communications. Those calls sent Fire and EMS crews to three different locations, according to Young. The timeline says the first call about smoke near the L'Enfant Plaza Metro station came from a construction site a half mile away at 3:18 p.m. 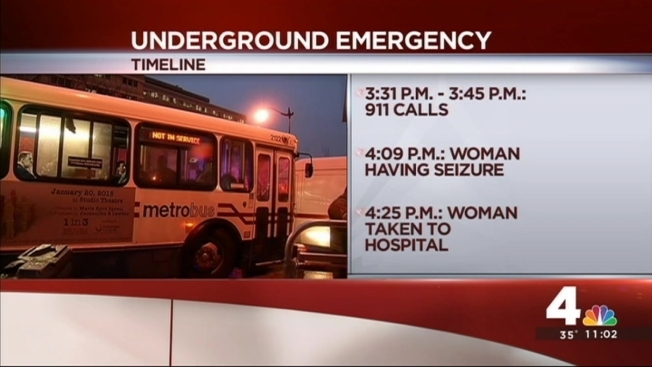 The caller told the dispatcher that smoke was coming out of the Metro tunnel at 9th and Water Street SW.
A call came in four minutes later reporting heavy smoke on the upper level of the L'Enfant Metro station. A rescue vehicle arrived at L'Enfant station at 3:31 p.m. The timeline does not indicate when first responders entered the tunnel and reached the stranded passengers. According to Young's report, a patient receiving CPR was transported to an area hospital at 4:25 p.m.
On Monday, the six-car subway train had just pulled out from the station when it ground to a halt and foul-smelling smoke began filling the tunnel and the cars. 3:14 - Metro Rail’s Unit 22 called to report a debris fire on the tracks at Gallery Place Station, upper and lower levels. 3:39 - A caller on the train advised that it was filling with smoke. During a press conference the day after the deadly incident, Bowser said that the fire department responded to the scene in a timely manner, although passengers told media outlets that they had endured waits of more than half an hour. "I of course will defer to the passengers who were on that train. We don't know what time the train actually went down...." Bowser said Tuesday. "It would appear that based on the calls that we received, the locations we reported to, that our fire department responded in the time frames that are customary," she said Tuesday.